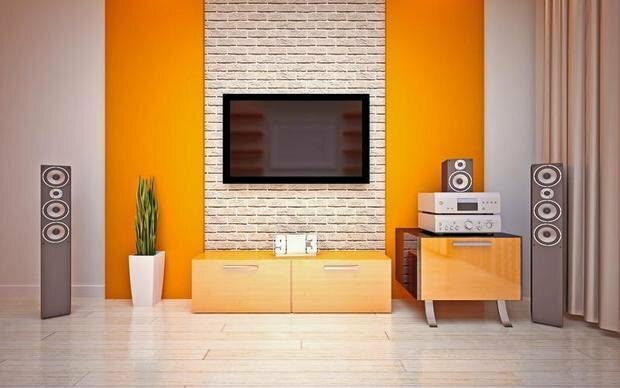 Televisions are getting thinner and lighter – and no longer require bulky cabinets underneath. 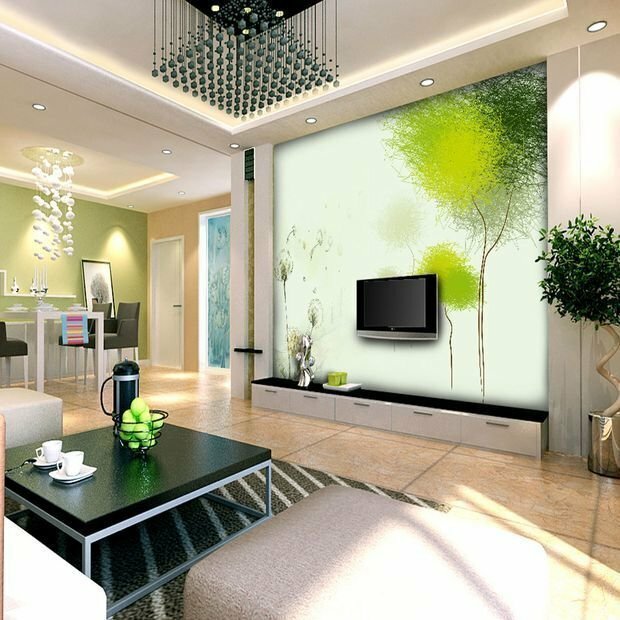 If you decide to hang your TV on the wall, certainly immediately the question arose about the design of the wall. 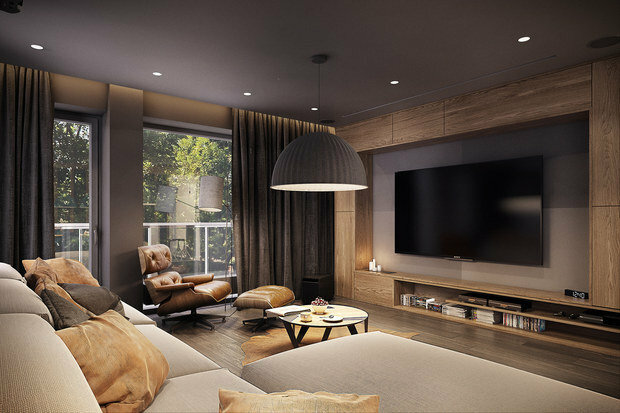 We have prepared for you 13 practical and stylish ideas that will help you to focus on the TV area in the interior or, on the contrary, visual “dissolve” it in environment. 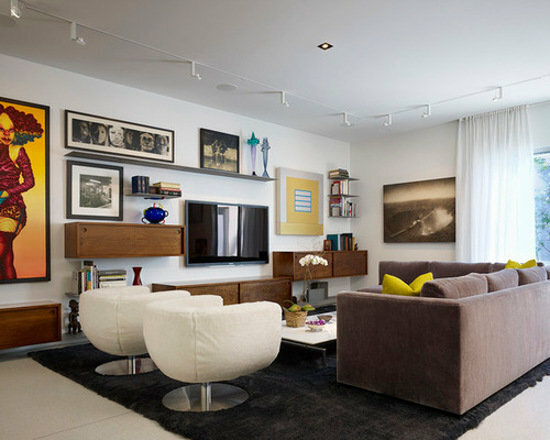 If the apartment is clearly not enough storage, they can be placed on either side of the TV or around it. A compromise for those who don’t like bulky cabinets and tables, several small wall and/or floor modules for storage. 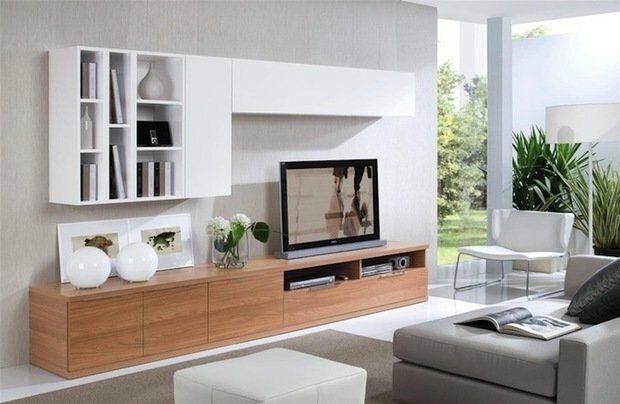 The combination of a neat console or cabinets and several open shelves also visually not too heavier interior. 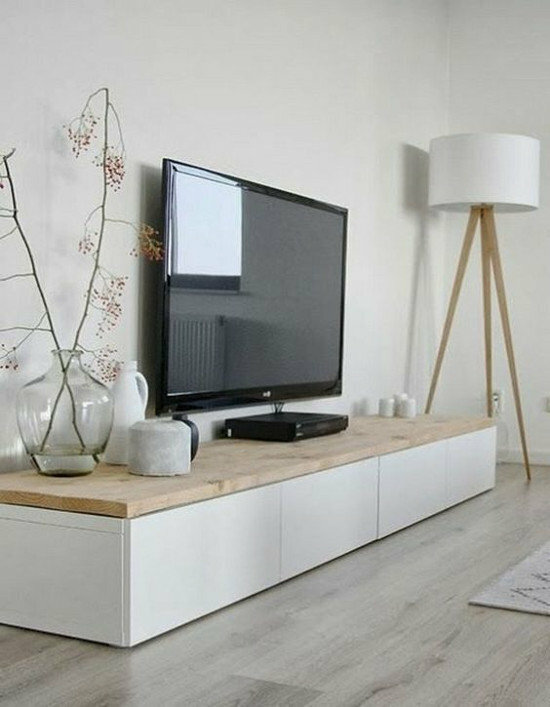 A great modern solution for cases when we want to highlight the wall behind the TV volume texture. Please note: today’s manufacturers offer 3D-panels of different colors: you can choose a contrasting shade or choose the option in the color of the walls. 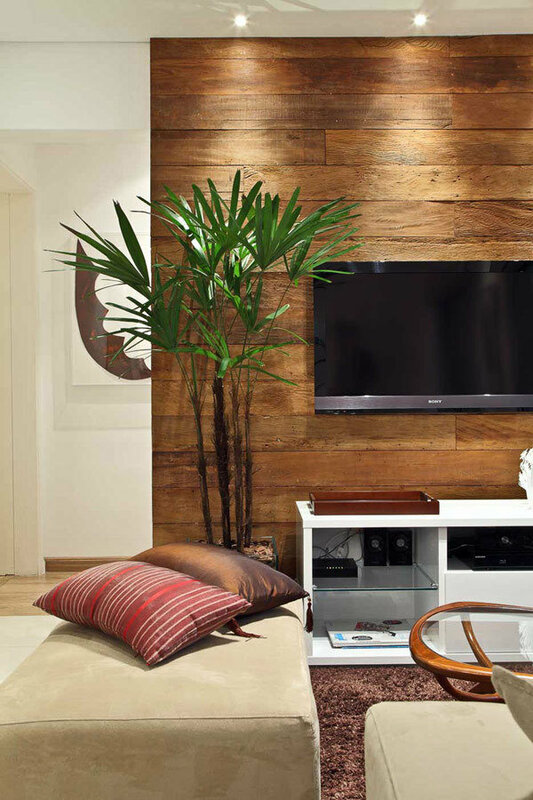 Lovers of natural textures and natural materials can decorate a tree, wall or part of wall behind the TV. You can choose natural wood, and more budget options – for example, a laminate. An interesting solution would be use for the finishing of walls of wooden slats. 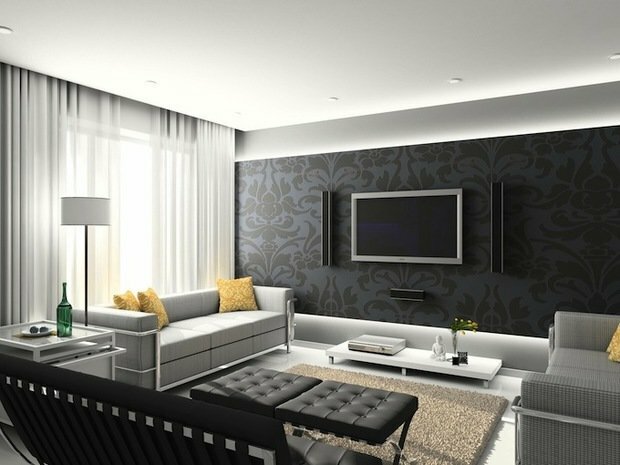 For rooms that need a visual magnification and additional natural light, a suitable solution can be a mirror or mirror tiles on the wall behind the TV (or on sides). Minus: the reflection in the mirror can distract from what is happening on the screen. 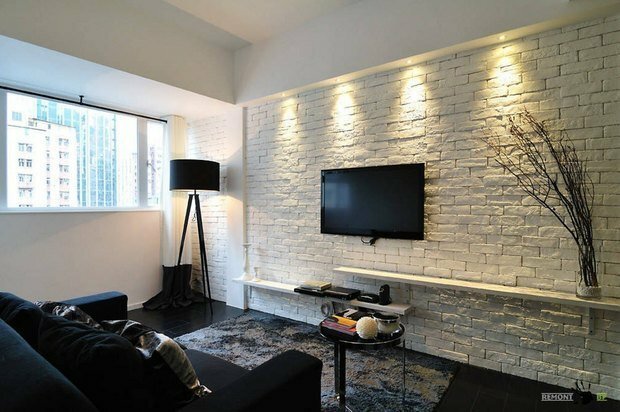 Natural or artificial stone, brick, and gypsum tile, stylized stone or brick is a great way to gently focus on the wall behind the TV and add the interior texture. An additional plus: the rock makes the situation more status. Minus: the natural material is often quite heavy. Wall panels made of natural or artificial skin is another option that can bring in the interior a stylish texture and visually make the situation more “expensive”. 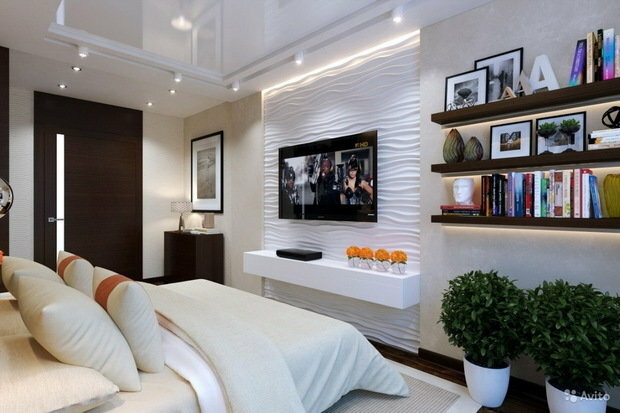 Not the most common solution is to finish the walls for the TV, having a number of advantages: reflective surface, resistance to mechanical damage, easy to care for. 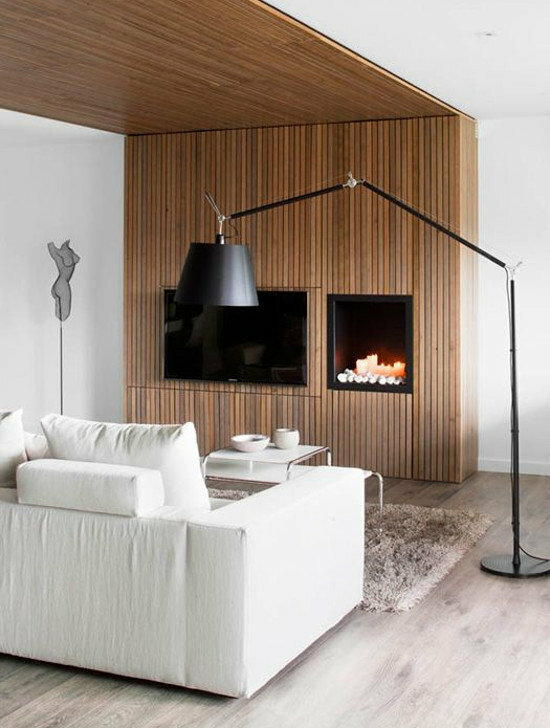 Minus – not for every interior style, the use of such material will be appropriate. 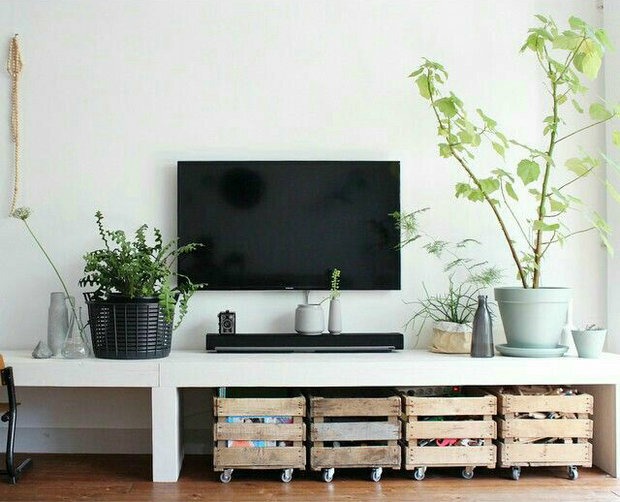 Fans of minimalism can leave the wall behind the TV is blank. Or, alternatively, place it on just one picture or a poster. Wallpapers – familiar, simple, and often quite a budget decoration accent wall. 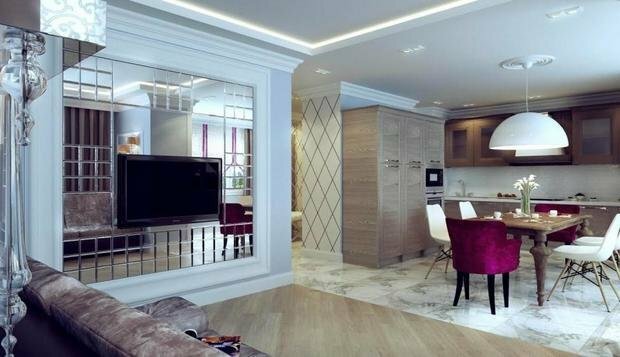 Not to be distracted from what is happening on the screen, it is better to choose not too bright Wallpaper without colorful patterns. 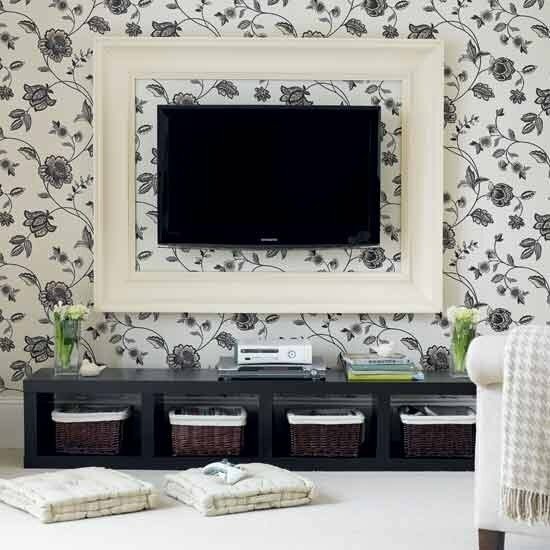 Wallpapers, for a long time unfairly forgotten by designers as “a relic of the past” and not so long ago, again back in fashion, can be a great option design and visual highlight in the interior wall behind the TV. 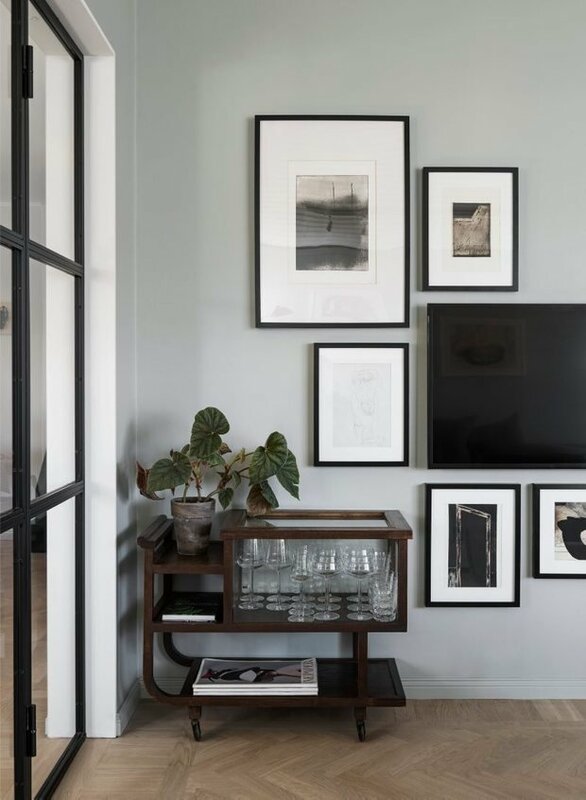 A topical version of the design wall for the TV, allowing you to “hide” the TV in the interior – a kind of wall gallery of paintings, photographs or even just empty frames. 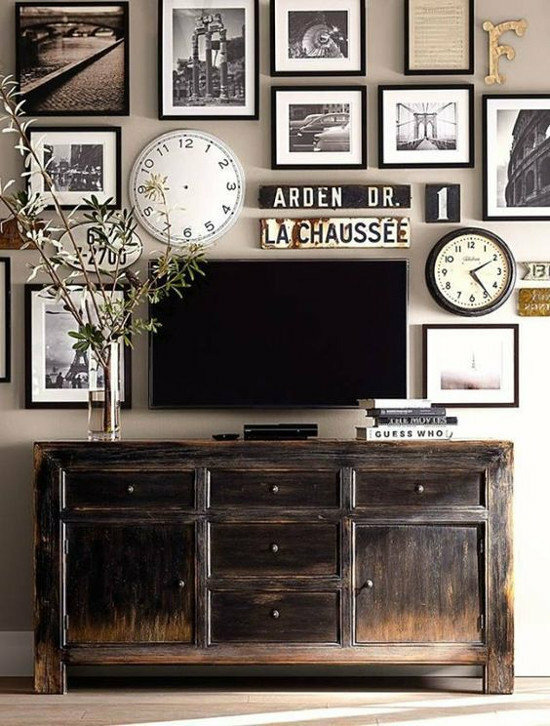 Neat accents on the sides of the TV – solution that allows, on the one hand, not to leave the wall empty, on the other hand, not to clutter it with furniture and unnecessary decor. 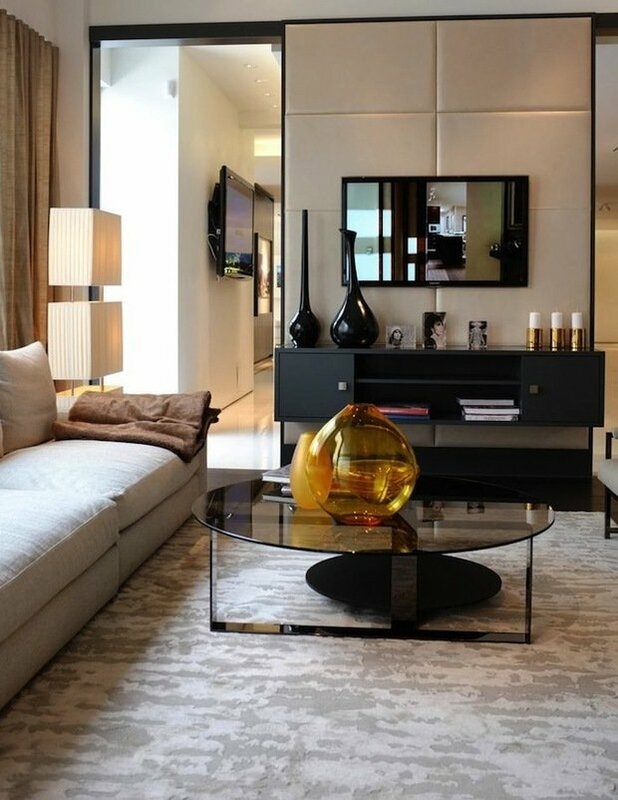 Such side emphasis can be arranged by using color, mirrors, wall panels. 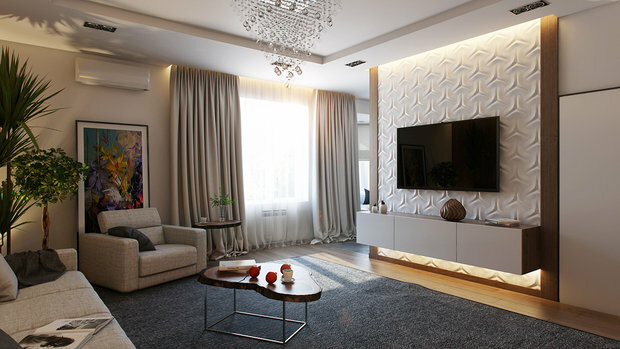 An extended version of the “gallery” also visually “solvent” in the interior of the TV, the combination of various wall elements of the situation. 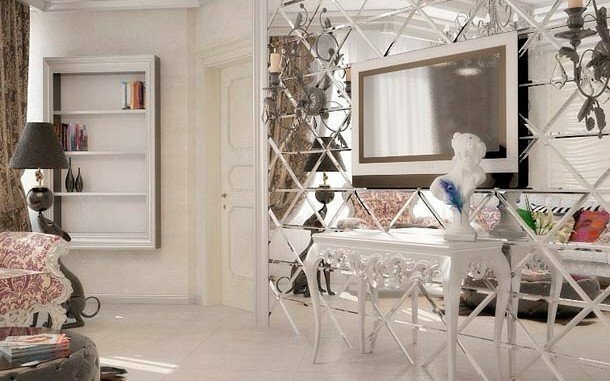 It can be open and closed shelves, paintings, clocks, panels, mini-showcases and much more. 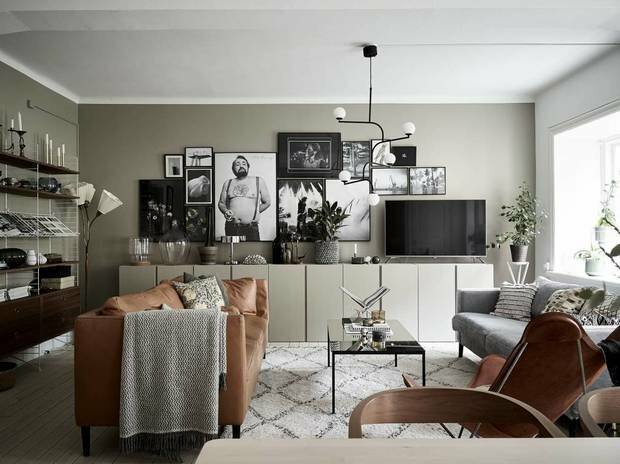 Minus: for the intelligent combination of a variety of wall decor need a real design talent – it is not so easy as it might seem at first glance.